TSOP’s first product is a Kontakt instrument called B11X, which was created by sampling every key and sound generator of a rare Polish synthesizer made in the 1980s. Apparently the source instruments had been designed solely by Polish engineers and assembled from Polish electronic components, plastic and copper! TSOP’s emulation is a faithful copy in many regards, but the designers have taken the liberty of making some improvements, such as adding extra effects, as well as MIDI control over the parameters. At B11X’s core is the Instrument page which has a strange mix of sound options and effects. Firstly there is a Solo panel with Trombone, Trompette, Clarinet, Violin and String options, all with switches, volume controls and tune knobs. None of the options sound much like the acoustic instruments they are named after, but they are all full of character nonetheless. Smoother, but no more realistic, sounds can be created using the Flute section, which offers five tuneable channels/registers. There is also a Percussion section for adding a bit of bite to the sound, and there are effects such as Tremolo, Wha–Wha and Vibrato. A kind of mixer panel makes it possible to adjust the relative levels of the Flute, Solo, Tremolo and Percussion sections, and altering their balance in this way can have a dramatic affect on the overall sound. Further effects are found on a page headed by a Filter Matrix section that includes a panel of switches for assigning the Flute, Solo and Percussion channels to either one of two filters. Below the Matrix panel are Phaser, Chorus, Delay and Amp processors, collectively providing plenty of sound–expanding and thickening options. The most interesting page, though, is found on the Applications tab. Here there are a set of user–definable keyswitch memories, plus something called a Block Chord Harmonizer, which allows the user to select a chord type, be it a minor, major, seventh, ninth, quartal or octave, and then shift the octave and level of the voices used in the chord. Finally, clicking on the Presets tab brings up a rather lovely menu page where it is possible to select a musical genre, such as Classic Pop, Movie Soundtrack, or Hip–Hop, to name just three of the 10 options, and then pick a ‘type’ of sound, the options being Pad, Lead, Organ, Piano, Mallet, Bass, Stab, Noise and Soundscape. Sounds that appeal most can be saved to a 10–slot Favourites menu, and there is another panel for storing user–created presets. Frustratingly, the various presets and favourites menus can’t be accessed when the other tabs are selected. 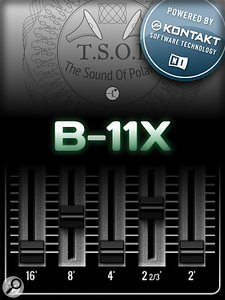 B11X is unlike any synth I’ve come across recently, which can’t be a bad thing. It’s controls are clear and simple, but altogether make a rather complex tool, capable of generating a reasonably wide range of interesting sounds. Although the modelling is based on an ’80s synth, its sound reminded me of something older. I eventually decided it was the domineering Dudley Simpson score for the 1971 Doctor Who serial The Mind of Evil, memorable for its aggressive detuned and modulated synth lines. Similarly, one ‘Piano’-type sound evoked memories of an early Tomita record! Synth enthusiasts should definitely take a look.